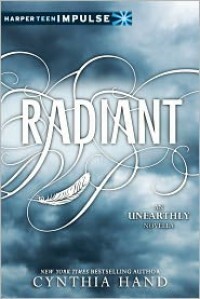 Originally posted at The Bawdy Book BlogI figured I needed to read Radiant before I get to Boundless, because you know these authors love to include little tidbits in their novellas. I didn’t want to feel left behind!Radiant is told in alternating first-person, between Angela and Clara. They’ve taken off for Rome for the summer after their graduation, to stay with Angela’s Italian family. Angela manages to deftly avoid questions about the Italian boy she’s been seeing during her summers there; meanwhile, Clara continues to miss Tucker and have visions, going into catatonic-like states – sometimes right in front of the Zerbinos, who then talk about her in Italian, not knowing she understands every word they say.She’s much nicer than I am.Angela acts like a best friend should, however, and is her shield during their stay. But things change between the girls when Angela sees her ex for the first time in a year, and begins acting all kinds of Shady Suzy.Radiant is a great teaser, and while I still haven’t gotten to read Boundless, it makes me that much more excited for it. It delivers juicy tidbits about the angels, and Angela in particular, and I can’t wait to find out what happens next. Because, dude, Angela has been keeping secrets. Secrets about boys, about her past, about everything! Her boyfriend – or whatever he is – Phen is someone I haven’t quite figured out yet. I’m leaning one particular way, based on his caginess, but he could surprise me in Boundless (if he’s in it). If there is one thing I think I learned from Radiant, it’s that I trust Clara’s judgement.So, in short, I need Boundless. Like, yesterday.